*Still $19.50 Worth Of Kellogg’s Coupons Available! There are a ton of new Kellogg’s coupons available via the hidden websaver.ca portal. They are all printable so make sure you have your printer ready to print some or all of these awesome coupons! 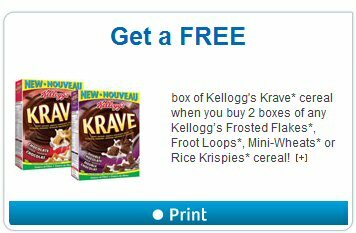 Click here to print your hidden websaver.ca Kellogg’s coupons There is a great coupon there for a FREE box of Kellogg’s Krave cereal when you buy 2 boxes of any Kellogg’s Frosted Flakes, Froot Loops, Mini-Wheats or Rice Krispies cereal. The FREE Krave cereal when you buy 2 coupon is valid March 8-10th only so make sure you use it if you have printed it!